It's the weekend and the kitties have taken over this blog! Since the House of the (Mostly) Black Cats is hosting this weekend, I thought it would be appropriate to feature the nearest I have to a black cat i.e. my fluffy tortoise shell kitten. 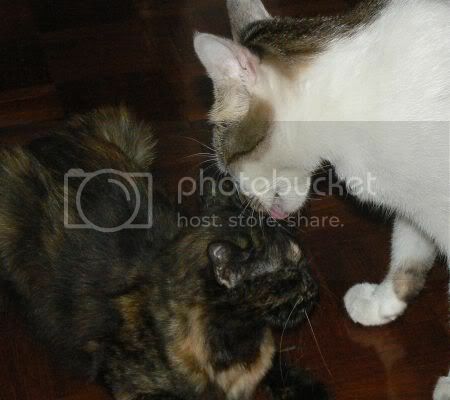 Although she's quite big nowadays, we all still think of her as the little one. Even her big brother thinks so and loves to baby her around especially in today's picture. He goes through mood swings of picking fights with her or licking her tenderly to tell her sorry he treated her so badly. For more adorable kitty pictures, hop over to the House of the (Mostly) Black Cats for the WCB round up. Bangsar's Ramadan Bazaar has also shifted from last year's location - they're now in front of Jolly Green Giant and just at the road where the car showroom is. It feels pretty small as it's just within the road but it's definitely better than last year as this time it is isolated in one area. Like Tigerjoe mentioned, it's advisable not to park in Jolly Green Giant itself as the entrance into the carpark is where the bazaar is being held. Try and park at Bangsar Village which is much better as you can access the place and leave it before any traffic jams start. Most of the regular stalls are still here but you can sport quite a few new ones that have imitated the food of several stalls from last year. 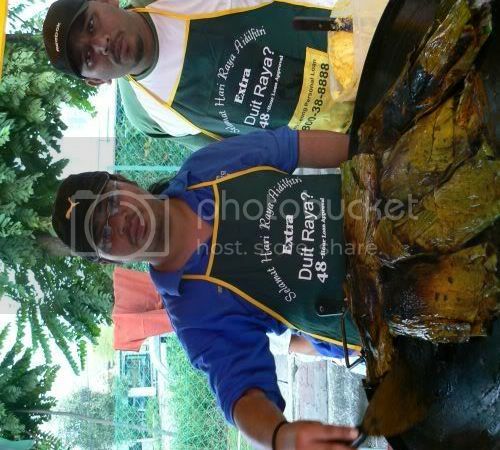 Last year's Ikan Terubuk Sarawak stall is also missing from this year's line up. Last year, I blogged about my first time eating Murtabak Roti Jala from the Sarawak Cafe which I tried. They have again opened a stall at the bazaar this year but another man has also opened a similar stall a few steps away from them. I managed to catch him in action making the Murtabak Roti Jala. The Murtabak part is cooked ahead on the hot plate and you can have a choice between chicken and beef fillings. 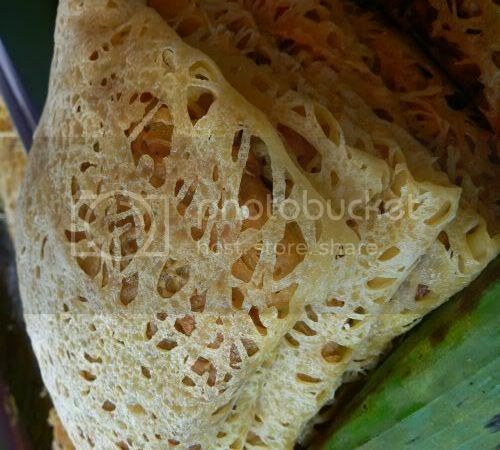 Subsequently, roti jala is then made by swirling this special contraption that looks like a cow's udder (it has small holes at the bottom for the batter to trickle down) with batter on the hot plate. Once the roti jala is cooked, you wrap the murtabak layer inside it. Here you have a stack of the finished product which we tried some last night. We both thought it wasn't anything fantastic and preferred the original murtabak. Although combining the two items is innovative, we felt the tastes of it was neither here nor there. 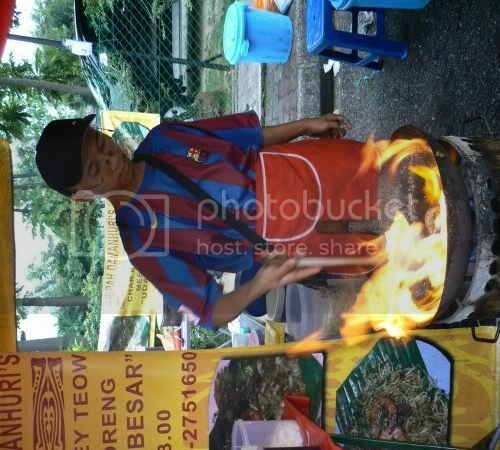 I had a fun time looking at this fella getting some wok action while making Char Kuey Teow for people. 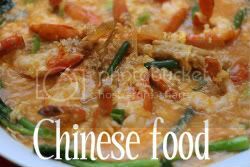 His version boasts large tiger prawns and looks so simple to make. He will add on items from the side i.e. the noodles, prawns and vegetables to the wok. Not sure why but his wok will also have flames flaring up after he adds some items. I suspect it must be additional oil or liquid that causes up the flames. 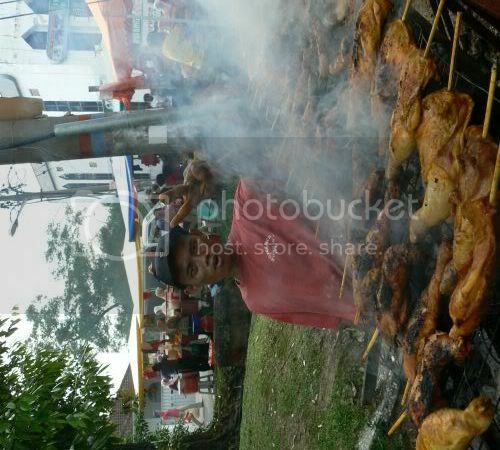 At the corner of the parking exit of Jolly Green Giant, there is a huge ayam percik stall. I was recommended by a family friend to try this as these guys are his friends. This friend of ours will sometimes help out at this stall whenever he is free. 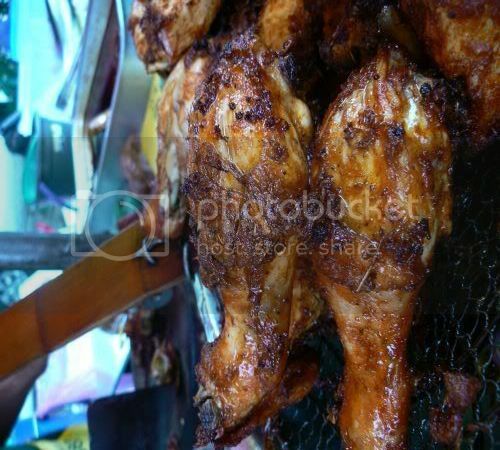 Ayam percik is a specialty from Kelantan and is basically spicy and marinated chicken that is grilled over hot charcoals. 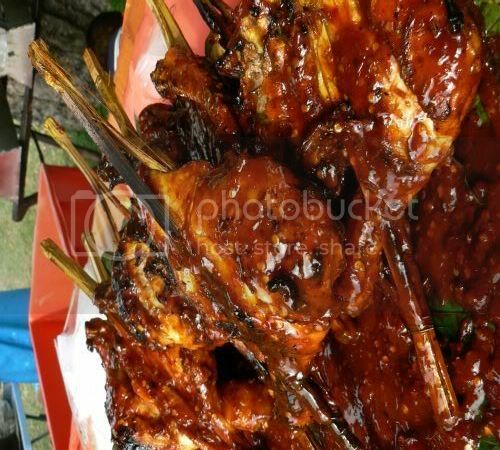 The chicken is marinated with ground spices such as lemon grass, ginger, lemon grass and chilli paste that is mixed with coconut milk and tamarind juice. It is then grilled and then served with a sauce made from chillies and coconut milk. We tried this ayam percik (one piece for RM4.50) and it was pretty good. At least this ayam percik was not dry and the sauce was creamy from the coconut milk and nicely complemented the chicken. Hong Leong Bank Berhad was out in full force selling the credit cards again. I think this year they sponsored all the aprons for the Ramadan Bazaars as I kept spying their advertisments on these aprons. Incidentally, I saw another camera happy person who was snapping pictures (I wonder who?) and I was told I must be Japanese since I was busy taking pictures. 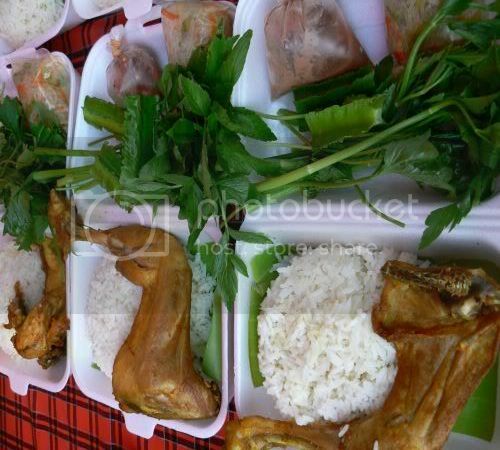 I thought this was a great way to break fast - ayam kampung i.e. 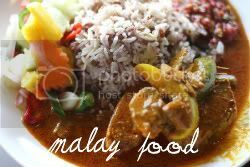 free range chicken that is deep fried served with rice, ulam (fresh vegetable salad) and sambal belachan dips. There were a few nasi lemak stalls around and this particular one was deep frying their chicken that came out glistening from the hot oil. You can choose which part you prefer and ask them to chop it up for you. This year there are two rojak singapura stalls at the bazaar. One seems to be doing better business than the other one i.e. this is the one nearer to the car showroom. 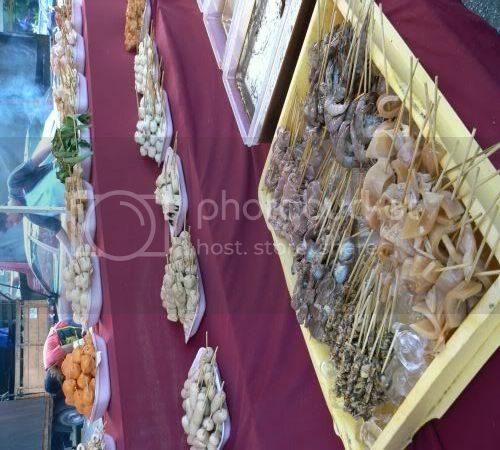 You can choose which deep fried items you fancy such as this deep fried sotong (calamari), little fried batter balls filled with different types of vegetables, tempe, tofu and etc. Hand them over the man behind the stall and he will cut it all up and give you the rojak sauce made from peanuts which you can add at home. Tigerjoe mentioned he tried the Rangoon Briyani which is a new item this year. What's different with this briyani is their rice grain is longer than the ones usually used in the local briyanis. They also colour the grains with turmeric. 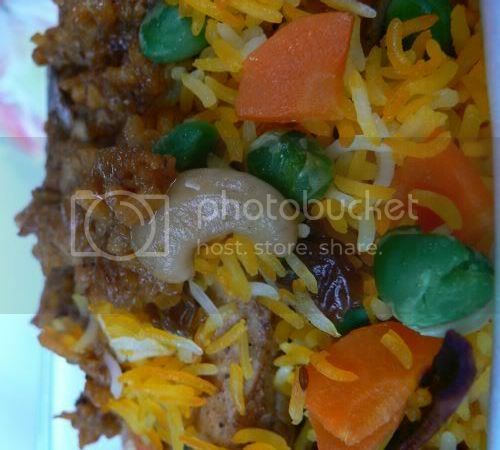 Similar to the Briyani Gam style, they cook their chicken within the rice. 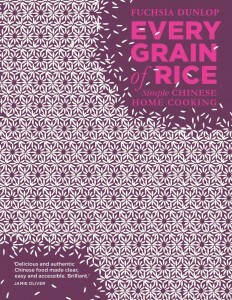 In addition, they sprinkle raisins, dried peas, carrots and cashewnuts on top of the rice. We gave it a try (RM6 for a portion) and we didn't think highly of it as it was slightly oily and not as fragrant. Both of us reckon the nasi briyani we had at TTDI's Ramadan Bazaar is still the best so far as the rice grains were fluffy and fragrant. 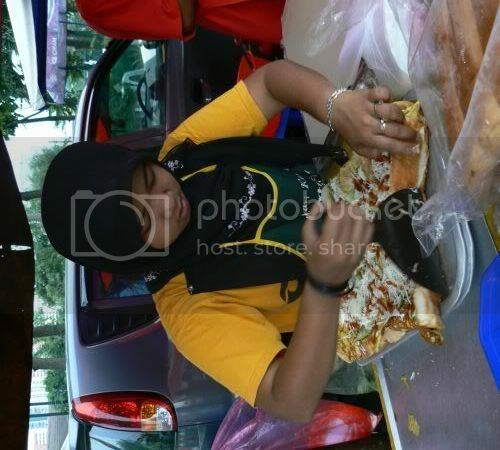 This stall was making roti john and cutting it up to place it in individual packets. Lots of shredded vegetables and chilli sauce has been added on top. 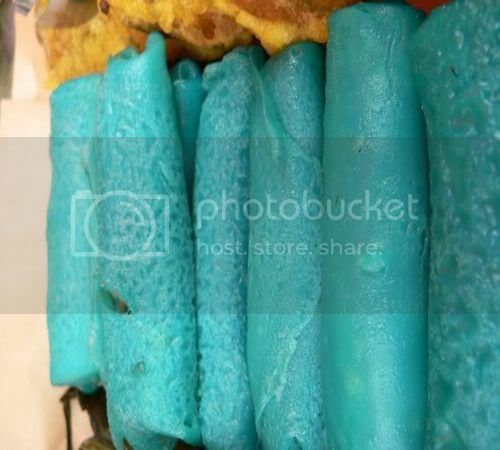 I spied these ridiculously bright electric blue kueh dadar! They may look interesting but it looks too scary to try some. This is what a kueh dadar should look like - green colour pancakes with a grated coconut filling tossed in gula melaka (palm sugar) syrup. 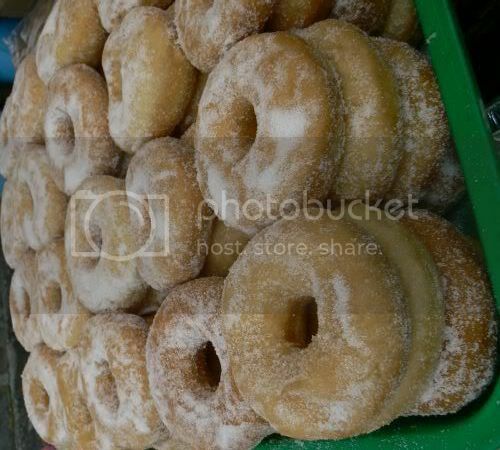 I found one stall which was selling all kinds of kuih and snapped lots of pictures there. Not sure why but the Bangsar stall owners don't seem to arrange their kuih in an appetising manner hence snapping pictures of them was a problem. 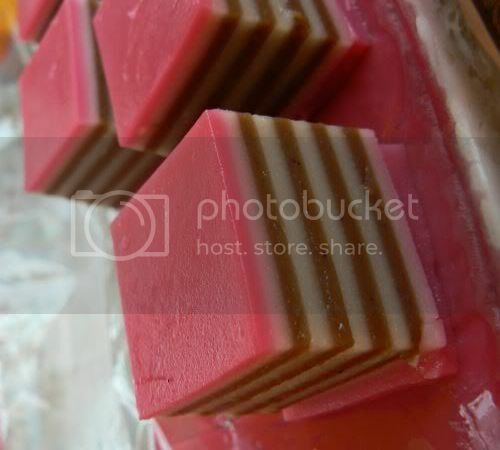 The only stall which arranged their items systematically was this stall that had the unique kuih lapis with chocolate layers. 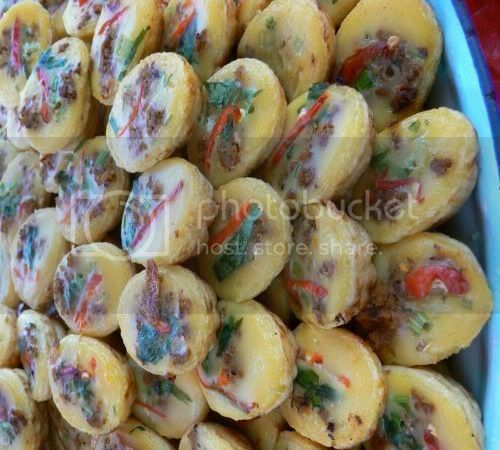 They were also selling lompat tikam, creme caramel, yam pudding in small containers. Their version of lompat tikam is just the green (pandan) layer topped with coconut milk layer minus the bright pink glutinous rice. 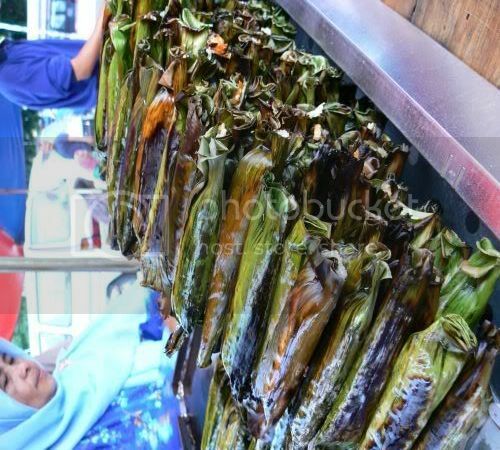 Something unusual at this bazaar was Kuih Jongkong which is wrapped up in a banana leaf parcel. This kuih is actually plain and made from rice flour and soaked in coconut milk. 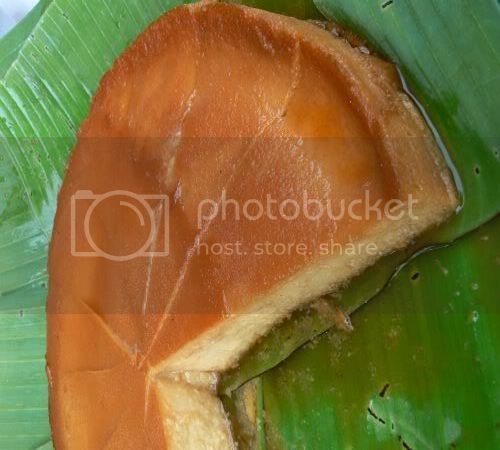 It's a Minang specialty and the kuih has a soft pudding like texture. You can even get doughnuts here all stacked up and dusted in sugar. Kuih and sweet items are always popular during Ramadan because you always break fast with kurma dates and something sweet. Another unusual item was the tiny deep fried popiahs filled with serunding ikan (fish floss flavoured with spices). Sorry for the not too great pictures since it was inside the packet hence there will be slight reflections. Don't forget to take something sweet home to drink also. You can choose Len Chee Kang near the ayam percik stall. 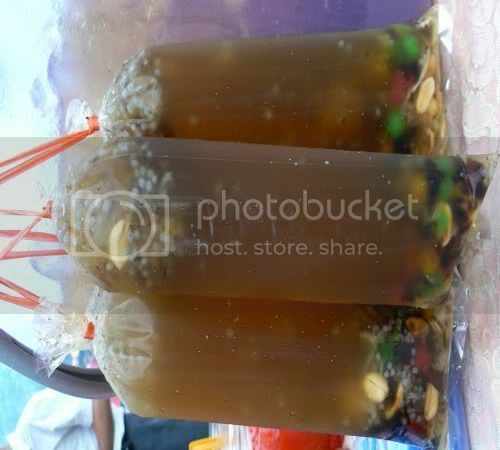 There's lots of items inside the drink - green sago balls, selasih (basil seeds), peanuts, black grass jelly and etc. Yesterday I decided to try out a Ramadan Bazaar that is pretty small but carries quite a few memories for me since it's one I have been familiar with since school days. I used to visit this place for Putu Piring but sadly the man who used to sell here is no longer trading here. Last year, it was the first Ramadan Bazaar I visited which led to this intensive coverage of the bazaars in town. 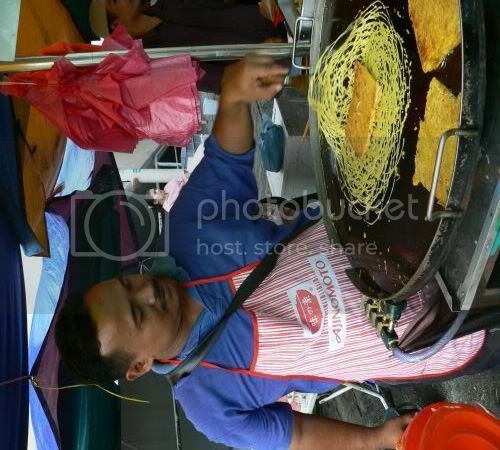 The first thing that greets you when you reach the bazaar is a long queue of people who are patiently waiting for this man to roll his famous popiah basah. Usually he has his stall at the Medan Selera just up the road but during Ramadan, you can only find him here. I have tasted his popiah at the Medan Selera before and it's yummy and one of the few in town that has prawns in it. 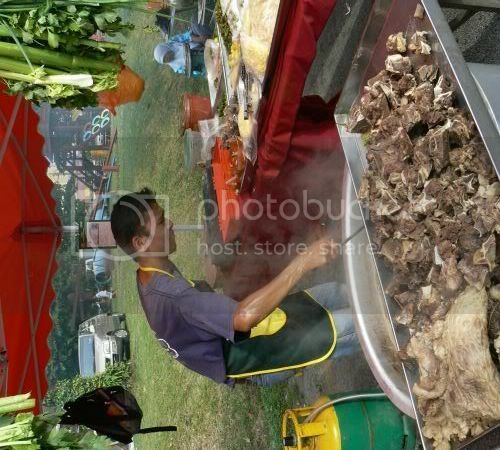 The bazaar is quite small with stalls that flank the road, Jalan 14/28 and near the playground. Nowadays even the bigger companies have grown aware of the pull of the Ramadan Bazaar crowd as Hong Leong Bank Berhad was there to promote their credit cards! One stall caught my eye as this fella was selling all kinds of interesting kuih and savoury items like this pulut serunding which is basically made from glutinous rice and sprinkled with savoury and spicy beef shreds. 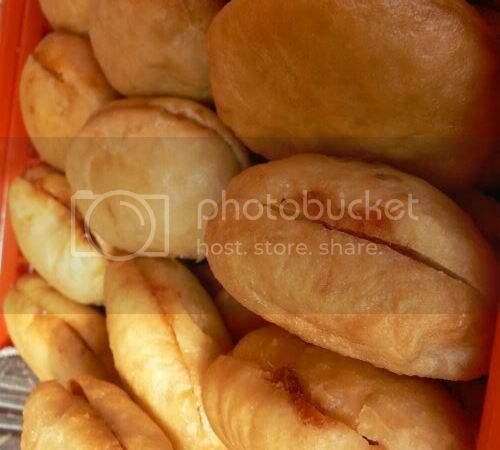 Another simple savoury item which is popular among everyone is the roti sambal. It's just plain buns that has a sambal filling. It's interesting to also observe what is popular at this bazaar and I reckon it's soups as I counted a few stalls that were rivalling for customers. This particular one was huge with a large selection of soups from the Northern state like sup gearbox, sup tulang and mee sup. I also liked how they decorated their stall with bunches of celery and coriander hanging from the top which is also used as a topping for the soup. So far out of all the bazaars I have visited this year, this is the first time I am seeing Ketupat Daun Palas which is usually made for the Hari Raya celebrations. 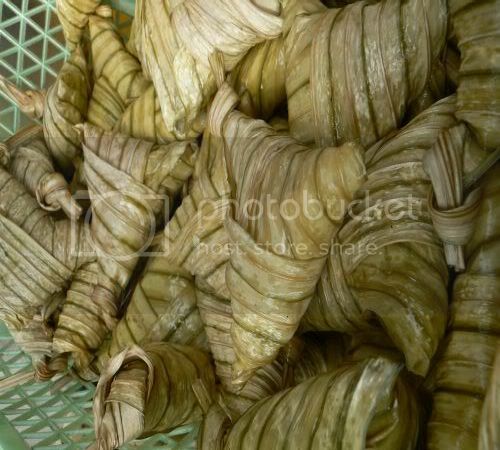 This particular ketupat is rolled with palm leaves and it has a sticky glutinous rice filling. 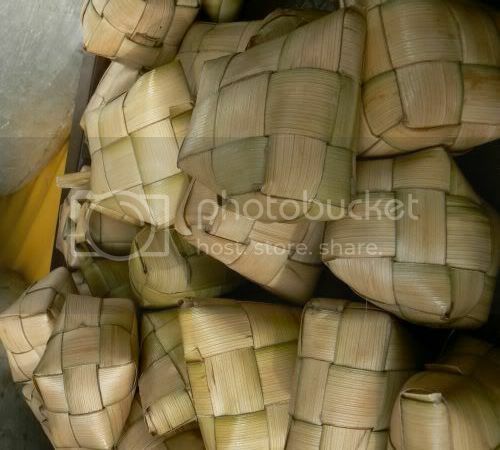 The same stall was also selling ketupat that we usually get whenever you eat satay. You can either eat this with curry, satay or if you fancy, serunding which was also available at this stall. 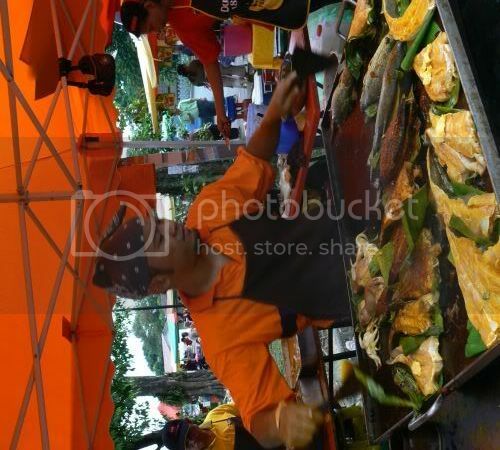 Last year I featured this ikan bakar stall which I understand is related to one of the famous stalls from Jalan Bellamy. I was tempted to try this for dinner last night but the queue was quite long hence I decided to try something else instead. However the smell of the fish grilling on the hot plate was really tempting. Drinks are extremely important during Ramadan as you need lots of liquids or else you will dehydrate. Although you get lots of colourful drinks at these bazaars, I usually prefer the more natural ones like coconut juice from young coconuts or sugar cane juice. 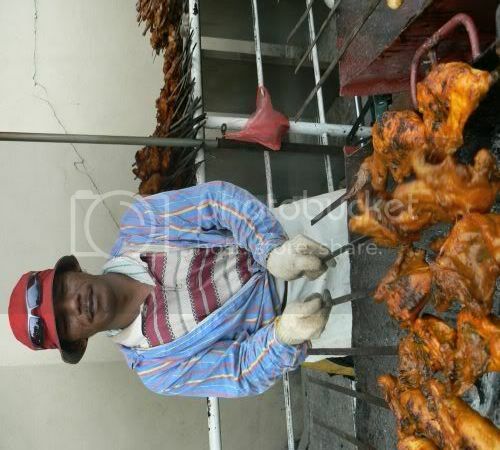 This guy was happy to pose for me while he was manning the grill for the ayam percik stall. Huge plumes of smoke was coming out from their stall that you can't miss it. 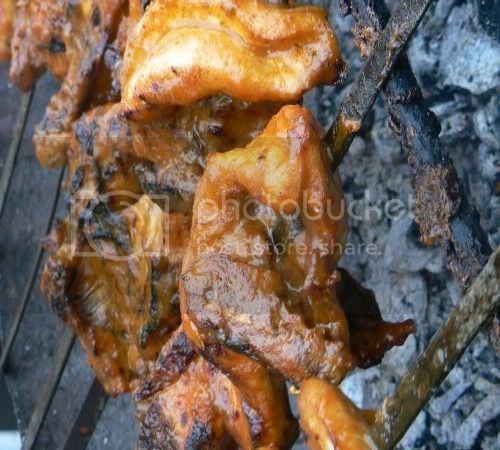 After it's grilled, it's coated in a sweet and spicy sauce. Although I like ayam percik, I usually don't get any because till todate, I have to find any nice ones. 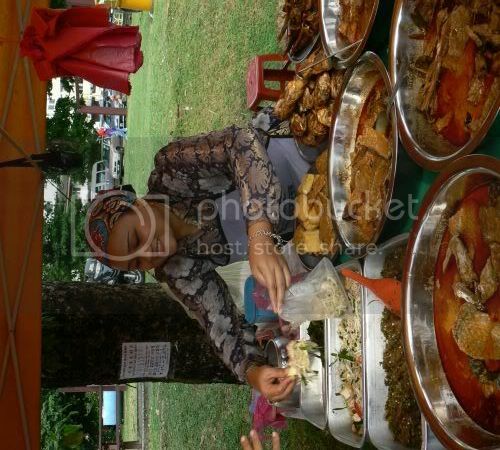 Looking at this picture, I reckon it's time to search for a nice ayam percik stall in my next few Ramadan Bazaars. 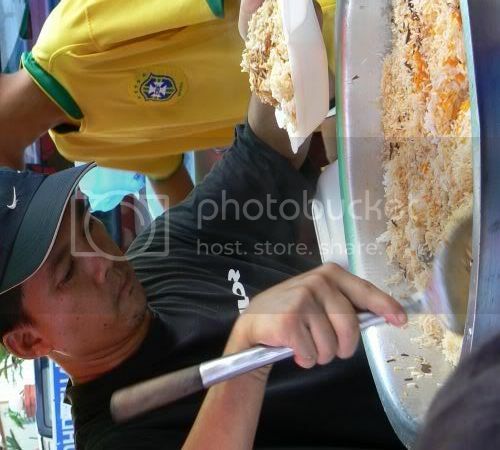 This is the only Ramadan Bazaar which is selling Nasi Minang. They have a selection of curries you can choose from including Gulai Kawah. I actually had my dinner here and it was pretty good. Sadly they didn't have any tunjang which is my favourite. You can usually get all kinds of jellies at the kuih stalls but this one must be the most colourful I have come across so far. The colours are positively psychedelic with their swirls. 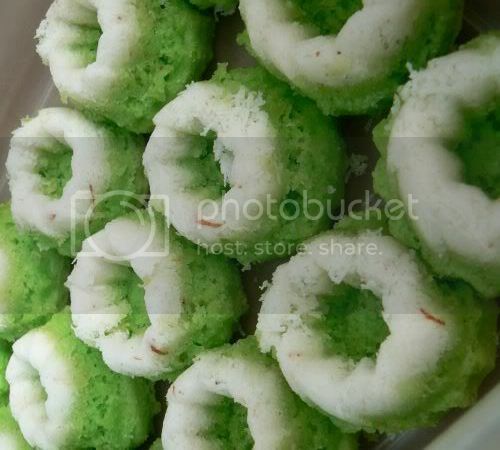 I love these green and white kuih known as Seri Ayu. 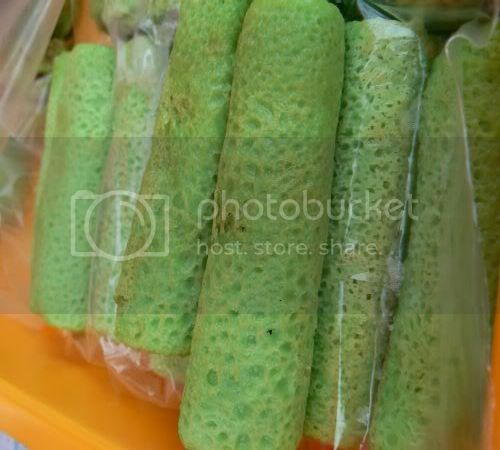 They're actually spongy with a hint of pandan and grated coconut. Not sure whether this is a traditional Malay kuih but it was pretty unusual to find it at the kuih stall - deep fried sesame balls which is more of a Chinese sweet. The kuih stalls here were doing booming business. One stall located in front was already packing up as their kuih had finished even though it was just 5.30 pm. It's advisable to get there early or else the popular items will run out quickly. The Taman Tun Dr Ismail (TTDI) Ramadan Bazaar has shifted again this year - from the market's carpark to Jalan Tun Mohd Fuad 3 and 4 which is near the new UDA condominium construction site. It feels smaller versus last year probably because there is more space to place the stalls and walk around. Personally, I prefer this location as it's easier to get parking with the two private car parks nearby. The first thing that greets you if you walk in from Jalan Tun Mohd Fuad 4 is this mountain of deep fried popiah. 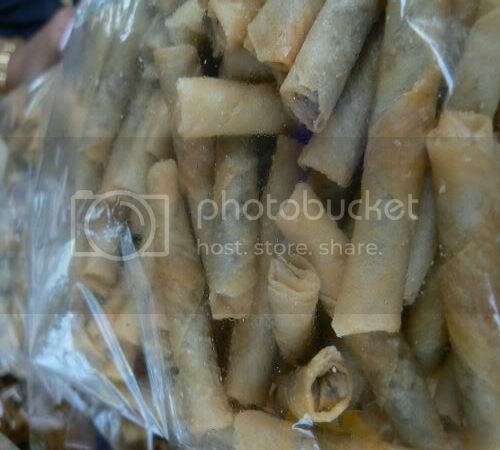 There are three varieties: popiah basah, deep fried popiah and popiah coated in a sweet chilli sauce. 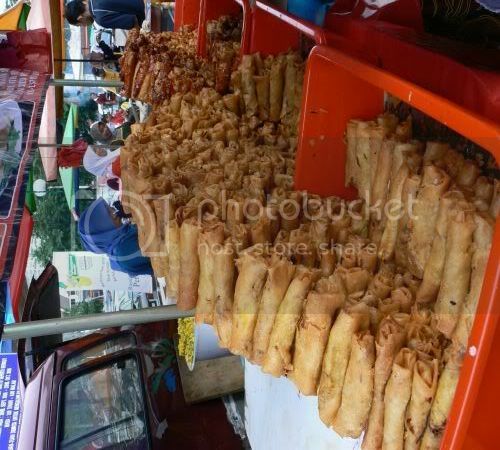 This popiah stall is a familiar sight if you're a regular to the night market on Sunday. I know I have another picture of the popiah assembly line from Gombak but this one was too colourful to ignore especially with the turmeric hue shredded yam bean they have added on top of the bean sprouts. 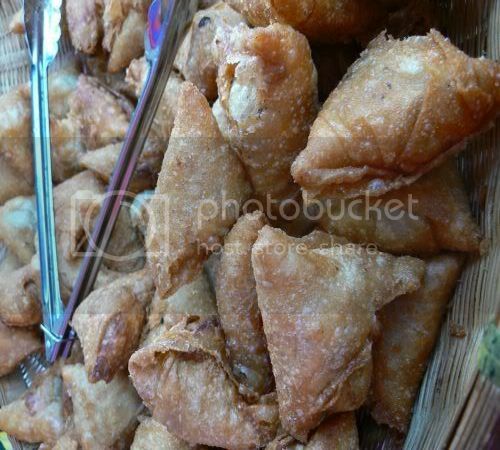 There was this stall selling deep fried samosas filled with beef or chicken. 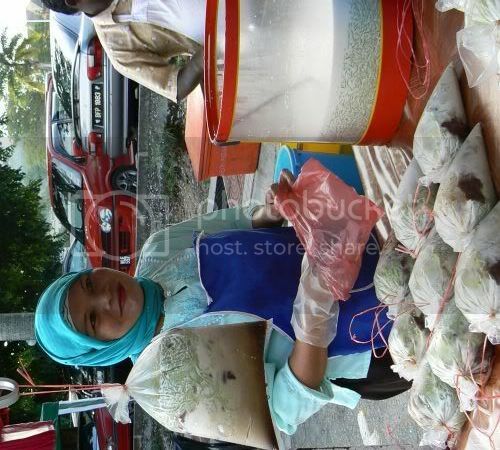 I also spied last year's Apam Tepung Beras stall which was selling their pastel coloured hued cakes. 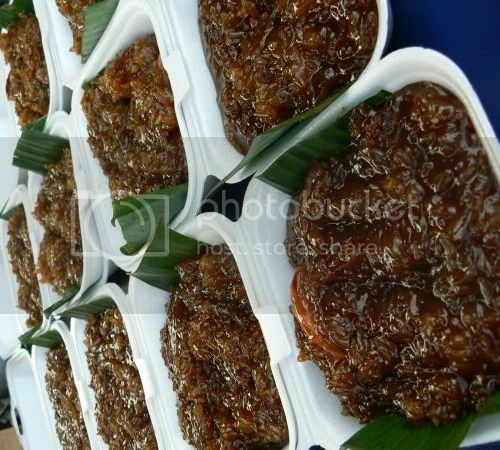 One of my favourites, pulut panggang which has glutinous rice and a filling of dried prawns, grated coconut and lemongrass. Extremely yummy especially when they are eaten hot from the grill. 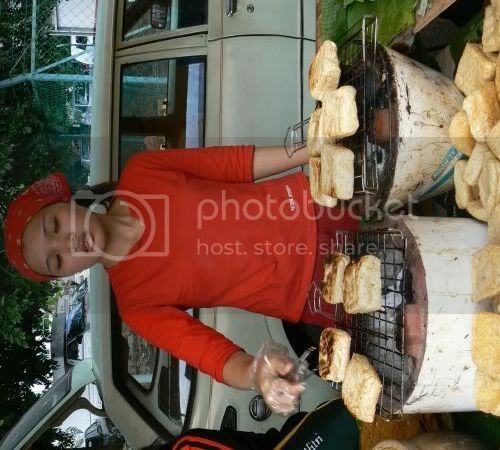 There was also last year's stall selling tapai pulut and lepat pisang inti. This enterprising fella was blowing a whistle or ringing his brass bell to get people to come to his stall which sold all kinds of cooked curries and vegetables, desserts like creme caramel and ayam percik. There is even the Malay version of Lok Lok whereby you can choose what you want and cook it in boiling water provided in pots. Dipping sauces are also available for you to add once it is cooked. Next to this stall, there were people from Colgate Palmolive giving out free toothpaste to everyone. This is the savoury version of kuih cara which has shredded chillies, chopped spring onions, fried shallots and minced meat inside. 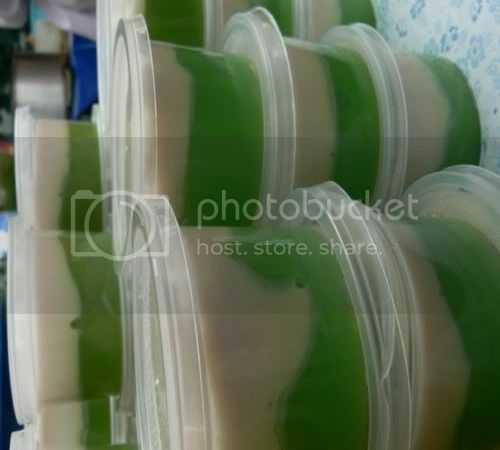 There is also a sweet version which is usually made from a batter that is flavoured with pandan essence and is green in colour. 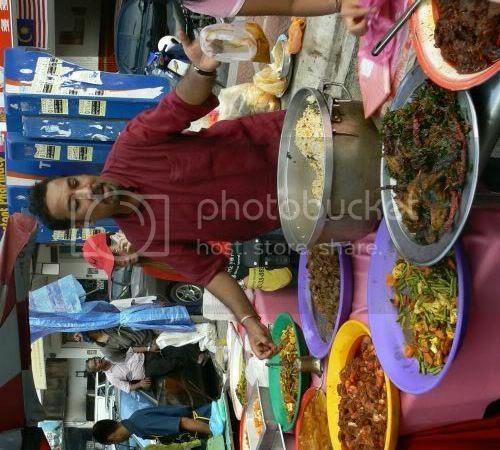 This particular Ramadan Bazaar has an abundance of stalls selling Briyani rice - there was An Nur Briyani from Kampung Baru which I ate once, Bombay Briyani and etc. I was totally confused on what to try out and I eventually decided to join the long queue which was forming when a stall opened at the crossroads of Jalan Tun Mohd Fuad 3 and 4. I concluded the food must be good since the queue started even before the stall had opened for business! 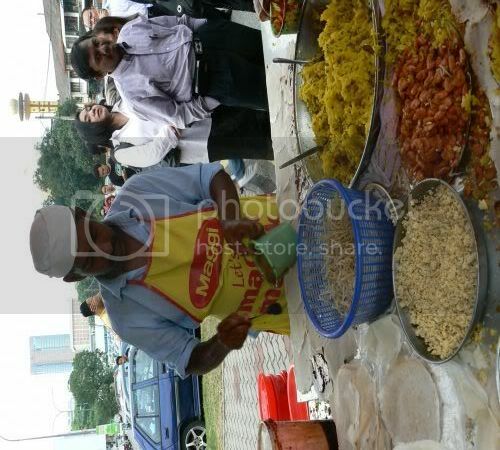 They were selling three varieties - briyani gam chicken, briyani beef and briyani mutton. We had the briyani gam chicken which was extremely yummy. It's also value for money as you get a mountain of rice with a piece of chicken for RM6. For those of you who are unsure about briyani gam, do try it they cook the meat within the rice which makes it more aromatic. 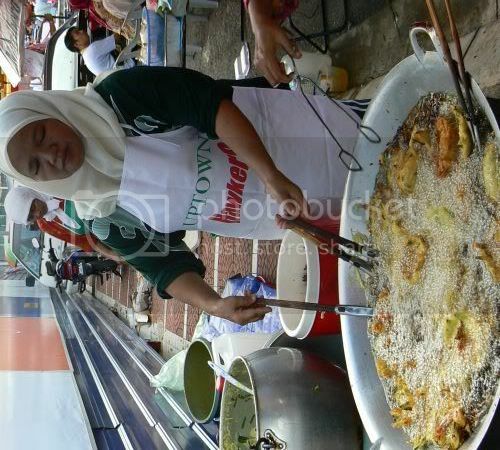 The An Nur Briyani stall was selling a Johor specialty - Telur Pindang that is cooked in herbs and spices. 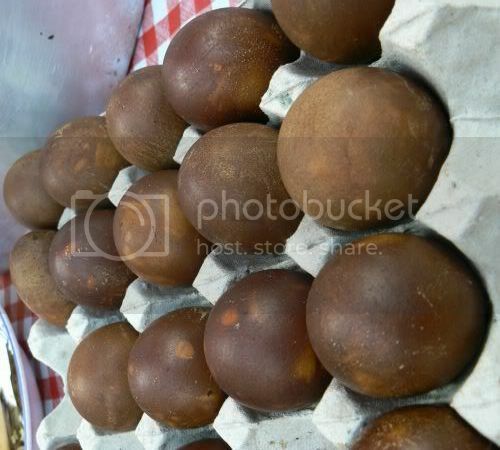 It's like the Malay version of tea eggs except herbs are used. There was even tauhu bakar being grilled over charcoal fire that you can enjoy with vegetables and rojak like sauce. Although there were two putu stalls i.e. putu bambu and putu piring, it was the latter that was doing brisk business. 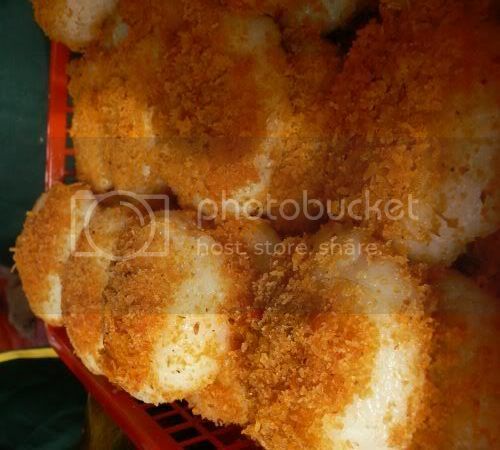 Unlike the other places, their putu piring is much smaller and going for RM0.40. This makes it nicer to eat as there's more palm sugar (gula melaka) filling versus the glutinous rice flour added in. However, you need to wait quite some time for them to cook it as people will order large batches of it. This bazaar also has cendol which you can pack to take home. It's nice and refreshing to drink this especially after one whole day of fasting. 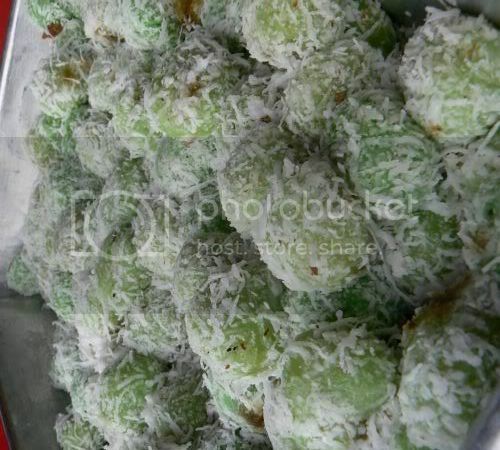 One of my favourites - onde onde that is made from glutinous rice flour tinted with pandan flavour and green colour. 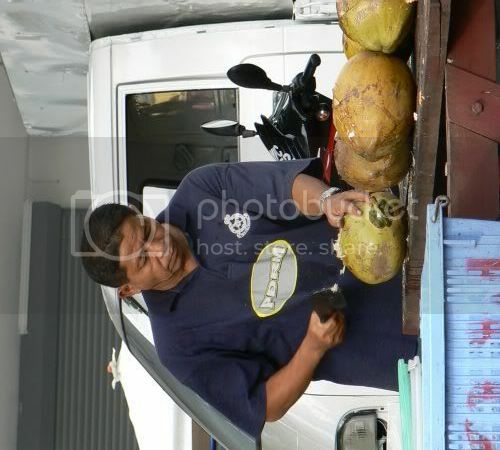 Inside it you will find palm sugar syrup (gula melaka) that complements the grated coconut it is rolled in. One stall was selling cucur udang that is made from fresh prawns. 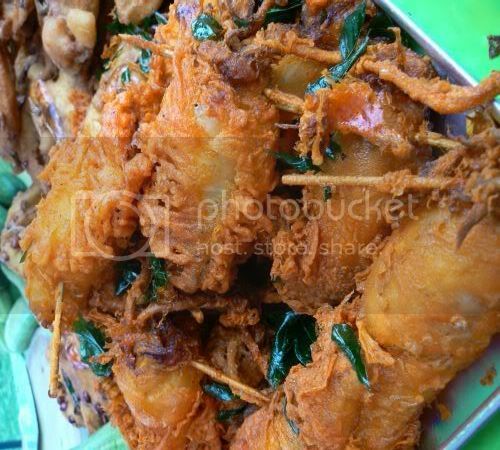 A batter is mixed with prawns and shredded vegetables that is deep fried till crispy. 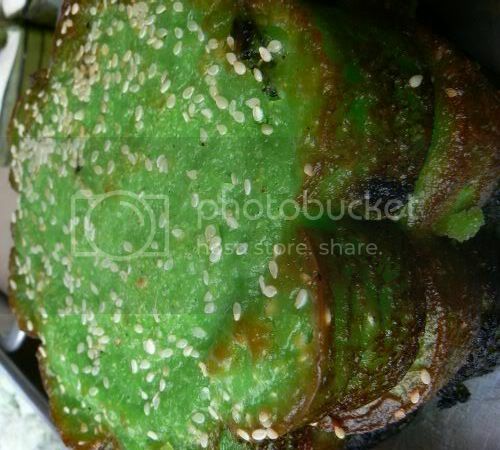 This brilliant green Kuih Bakar caught my eye. It's made from a batter whipped up from coconut milk, flour, eggs and pandan flavouring. After it is baked, sesame seeds are sprinkled on top of it. Something which is also popular at these bazaars is the Creme Caramel. 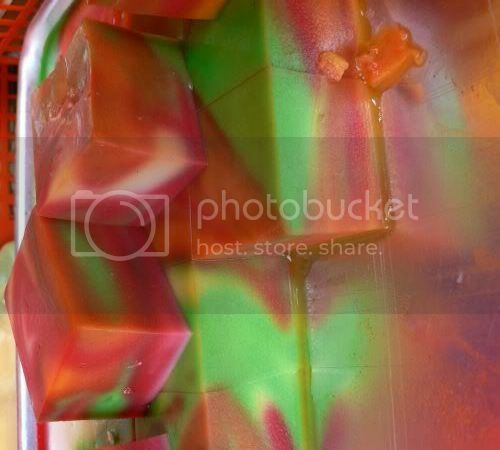 You can either buy them in slices like this or in small plastic containers. 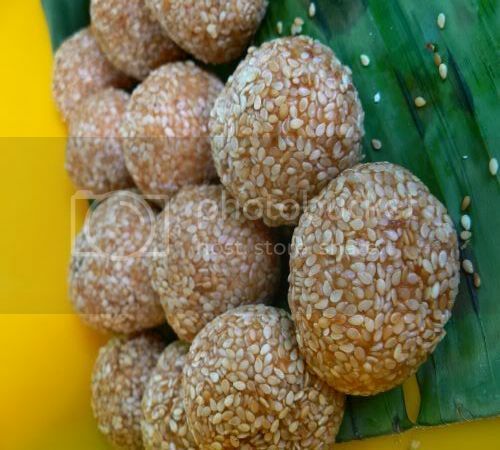 Another unusual dessert available here is the Wajik made from glutinous rice grains, coconut milk and brown sugar. I think this variety has added durian in it making it rich and inviting. Although TTDI's Ramadan Bazaar is quite small compared to Kelana Jaya's Ramadan Bazaar, it does have a pretty good variety. Thumbs up to the yummy Nasi Briyani Johor and Putu Piring which I will definitely be revisiting to try again. It's also a great place to bump into old friends as everyone goes here to get their dinner treat for the day.